NEW YORK (AP) — U.S. stocks inched lower Friday as bond yields jumped, a shift that helped banks but hurt companies that pay big dividends. The dollar fell after President Donald Trump said China is manipulating its currency. Companies including Microsoft and Honeywell rose as investors were pleased with their quarterly reports, but General Electric stumbled. Stocks wobbled all week as investors reacted to solid company results as well as heightened trade tensions. 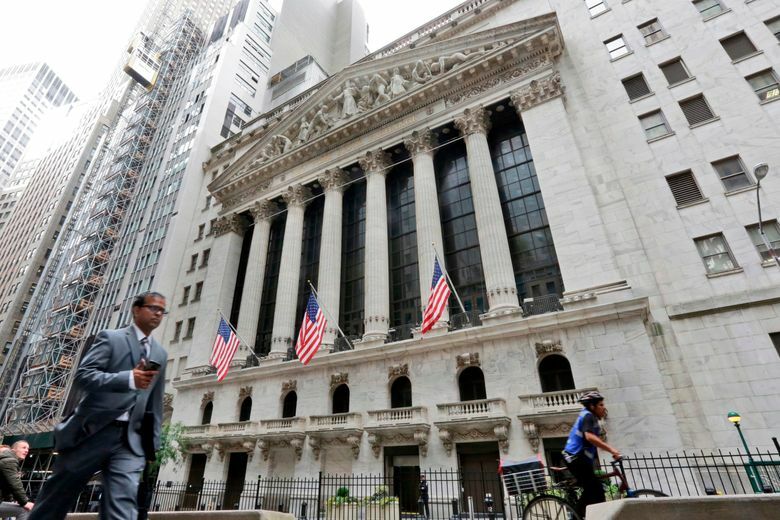 The S&P 500 index was virtually flat for the week while the Russell 2000 index, which is made up of smaller companies that do more business inside the U.S., rose 0.6 percent. In the last two days Trump criticized the Federal Reserve for raising interest rates and said China, said he’s willing to put tariffs on all U.S. imports from China, and said China, the European Union and others are harming the U.S. by weakening their currencies and reducing interest rates. Stocks weren’t affected, but the dollar declined and short-term bond yields slipped, suggesting investors wondered if the Fed might raise interest rates more slowly. “If there’s a toss-up between raising and not raising (rates), you wonder what role these types of comments might possibly play,” said Sameer Samana, a strategist for the Wells Fargo Investment Institute. Samana said he doesn’t think the Fed will make big changes to its policies based on Trump’s comments, even if the president starts advocating more forcefully for lower rates. But it’s something investors will have to think about. The S&P 500 index dipped 2.66 points, or 0.1 percent, to 2,801.83. The Dow Jones Industrial Average lost 6.38 points to 25,058.12. The Nasdaq composite gave up 5.10 points, or 0.1 percent, to 7,820.20. The Russell 2000 index of smaller-company stocks fell 4.50 points, or 0.3 percent, to 1,696.81. Short-term bond yields inched higher. The yield on the 2-year Treasury note rose to 2.60 percent from 2.59 percent. Long-term bond prices dropped. The yield on the 10-year Treasury note rose to 2.90 percent from 2.85 percent. That helped banks because bond yields are used to set interest rates on many kinds of loans including mortgages. JPMorgan Chase gained 1.3 percent to $111.28 and Bank of America picked up 1.6 percent to $30.13. The dollar dropped sharply, to 111.52 yen from 112.46 yen. The euro rose to $1.1726 from $1.1644. Microsoft continued to set records after its fiscal fourth-quarter results topped Wall Street forecasts and its cloud computing division continued to grow. The company said it’s being helped by its rivalry with Amazon, because some retailers are reluctant to team up with Amazon on cloud computing services while they compete with Amazon in sales. The stock climbed 1.8 percent to $106.27. General Electric lost 4.4 percent to $13.12 after it said its power business continued to struggle as revenue and orders decreased. GE, which has been selling and splitting off businesses, also cut its forecast for how much cash its businesses will generate. In a taped interview with CNBC, Trump said “I’m willing to go to 500,” referring roughly to the $505.5 billion in goods the U.S. imported last year from China. Earlier this month the U.S. placed import taxes on $34 billion in goods imported from China and Beijing responded in kind. The Trump administration is considering tariffs on another $200 billion in goods. The dispute between the world’s two largest economies stems from accusations that China steals technology from U.S. companies or forces them to hand over technology to Chinese companies as well as differences over the U.S. trade deficit with China. Investors have worried that the trade war and other disputes involving the U.S. could slow down the global economy. The People’s Bank of China weakened the country’s currency against the dollar on Friday. If the yuan continues to depreciate, goods exported to China will become more expensive to consumers there and Chinese exports would also be relatively cheaper. That could balance out suggested increases in tariffs by the Trump Administration. The yuan has been skidding since February, mostly because of slower economic growth in China and rising interest rates in the U.S. Benchmark U.S. crude added 1.4 percent to $70.46 a barrel in New York and Brent crude, used to price international oils, gained 0.7 percent to $73.07 a barrel in London. Wholesale gasoline rose 1.2 percent to $2.07 a gallon. Heating oil edged up 0.7 percent to $2.10 a gallon. Natural gas lost 0.4 percent to $2.76 per 1,000 cubic feet. Gold rose 0.6 percent to $1,231.10 an ounce. Silver gained 1 percent to $15.55 an ounce. Copper jumped 2.2 percent to $2.76 a pound. Germany’s DAX lost 1 percent and France’s CAC 40 slid 0.3 percent. Britain’s FTSE 100 gave up 0.1 percent. South Korea’s Kospi added 0.3 percent and Hong Kong’s Hang Seng gained 0.8 percent. Japan’s Nikkei 225 fell 0.3 percent.